Alliance Doors offer a bespoke range of fire shutters which are highly versatile & durable and can be made to fit any building, no matter the size or shape of the opening you require. Installing fire shutters across the North-West, Alliance has secured a strong brand reputation for installing industrial Doors, giving our customers the confidence when buying into our services. Check out our wide range of fire shutter systems which will help prevent the spread of a fire and contain the hazard until the authorities arrive. They can also seal rooms from one another to prevent the fire spreading into a stock room or showrooms. All of our fire shutters are designed to comply with the standard set by BRE fire research centre. Alliance has been awarded the certification for up to 4 hours fire protection with all our fire shutters. By meeting this standard you can put your mind at ease knowing that your premises will be secure and have fire prevention methods put in place that adheres to the industry standard. Does your fire shutter require maintenance or repairs? 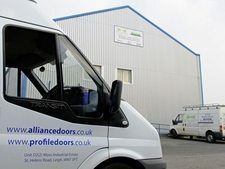 Alliance Doors are specialist in repairs and maintenance. 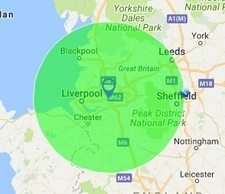 All of our engineers are fully qualified and have been fitting industrial doors of all shapes and sizes to our clients for many years. While visiting your premises our engineers are able to give you the expert advice needed to ensure your fire shutter continues to work as it should and prolong the doors lifespan. All our engineers have been through intensive training programs to ensure the quality of work is to the highest possible standard. We’re also able to carry out servicing and maintenance on bespoke fitments such as aircraft hangers meaning that we are not limited to what we can repair or fit as new. 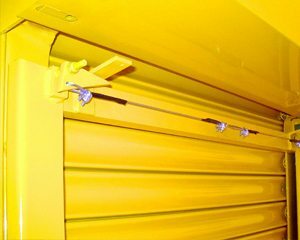 A 4 hour fire rated push up / pull down industrial fire shutters suitable for openings where the door is required to stay in an open static position until the onset of fire in close proximity. Door is held open on a fusible link which separates at 72 degrees causing the door to fall under gravity creating an impregnable fire seal of 240 minutes. 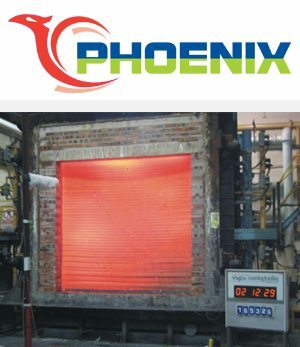 A 4 hour fire rated power operated industrial fire shutter suitable for larger openings which need to be used on a daily basis. Can be operated by solenoid (connected to fire alarm) or fusible link. Driven by a three phase or single phase motor. Can also have the addition of a Fire Door Interface Panel which can give timed delay or re-open feature. Photo-cells can be added to panel as an additional safety feature. Once the door is in the closed position, it creates an impregnable fire seal of 240 minutes. Solenoid – Needs to receive a 24V DC signal (non-polarised) from the fire alarm to trigger the solenoid. Door will fall under gravity by releasing the brake on the motor. FDI panel – Can receive either a 24V DC signal (non-polarised) or normally open/normally closed volt free signal. Capable of time delay feature on pedestrian egress routes as well as automatic re-open facility once the fire alarm has been re-set. Photo-cells can be added to prevent the door closing onto an obstruction which will be overridden in fire activation mode once three complete attempted closings have been made. Door will be driven down via the motor, but in the event of a power failure the FDI panel will trigger the solenoid causing the door to fall under gravity. 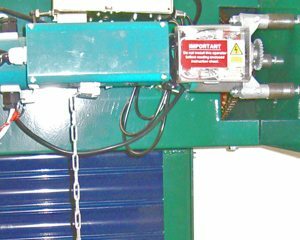 A 4 hour fire rated chain operated industrial shutter suitable for opening where a power supply is unavailable and where doors are tested on the fire alarm on a regular basis. Can be operated by solenoid (connected to fire alarm) or fusible link. Driven by a gear box with haul chain facility. Once the door is in the closed position, it creates an impregnable fire seal of 240 minutes. 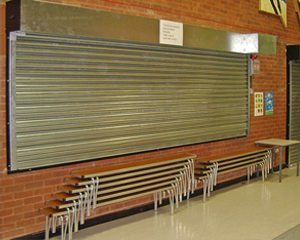 A 2 hour fire rated tubular motor shutter more suited to smaller openings such as kitchen serveries and reception counters. Compact design gives excellent aesthetic finish using the 50mm flat lath. All doors come with a manual override. Door is operated by key switch or push button linked to AEO-900 relay to allow for link to fire alarm. Battery back-up is available as an option if a maintained supply is not available. Normally open volt free contact is required from the fire alarm. Once triggered the door is driven closed under power. Can also have the addition of a Fire Door Interface Panel which can give timed delay or re-open feature. Photo-cells can be added to panel as an additional safety feature. Once the door is in the closed position, it creates an impregnable fire seal of 120 minutes. Please Note – Door must have a maintained supply. If this is not available then a battery back-up unit is required. Profile Door Engineering – experts in sliding, folding doors. Heavy-duty door ideal for goods lifts, the Ram-Fold Lift Shutter Door is designed to maximise the opening width, running smoothly along discreet top and bottom tracks with the shutter folding neatly to one side. Rolled from a single sheet of steel, the one-piece picket ensures the lattice and leaf have an even operation within the door whilst retaining strength. 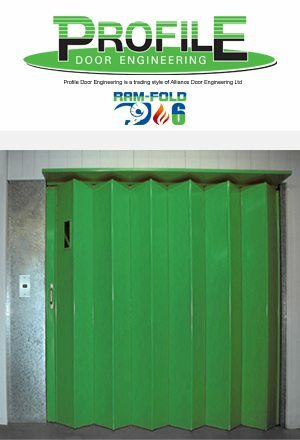 The door consists of 152mm (6”) galvanised plain sections, hinged vertically by a continuous hinged strip.